Are your seat belts broken?Get them fixed for free!!! Are the automatic seat belts in your Nissan acting up? Does the belt refuse to plug into the buckle? Does the belt stay in the driving position all the time? How would you like to fix all of those issues, at no out of pocket cost? I know there are lots of you out there suffering from these problems. Some of you, like me, have just been dealing with it, you unplug both belts every time you get out, or maybe you just don’t wear them at all. Or maybe you cant, because they wont buckle. There is something you need to know. 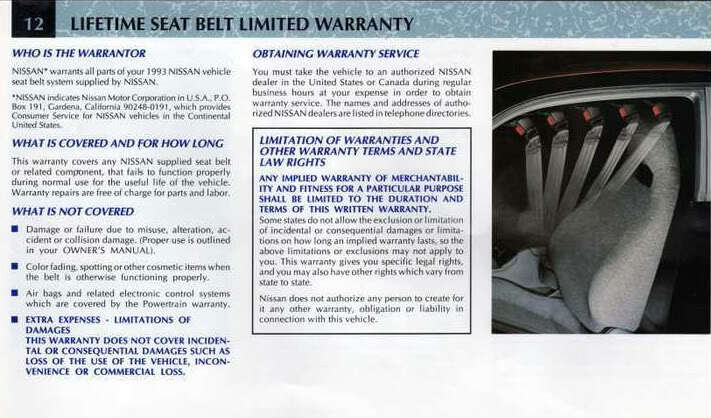 The factory seat belt system on your 1989-2002 Nissan vehicle is under factory warranty FOREVER!!!! They will fix it, and they will do it for nothing as long as you have not tampered with the system. 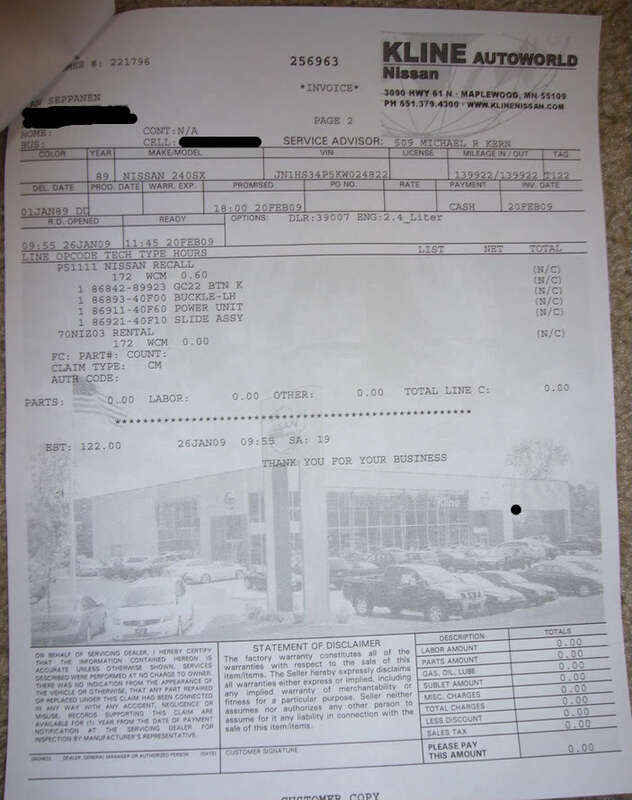 For 2003 and up Nissan vehicles, the warranty is valid for 10 years. Every Nissan is covered. Free….. that’s right, I said free. Many have tried it, but most often, a call to the dealership will yield nothing, even going in wont work unless you press them. Nissan dealerships, like any other business, don’t want to do things for free. It is to be expected, and you may need to do a little strong arming to help them see the light. Once they understand you mean business, everything should flow smoothly. What does this mean in layman’s terms? Every part of the seat belt system is covered for the useful life of the vehicle. If you are still driving the car, then they are under warranty. Notice there are a few things that they will not cover, but in essence the wording is very loose, and can be interpreted as such. Here is how I went about things. This should give you any idea how make sure they take you seriously. 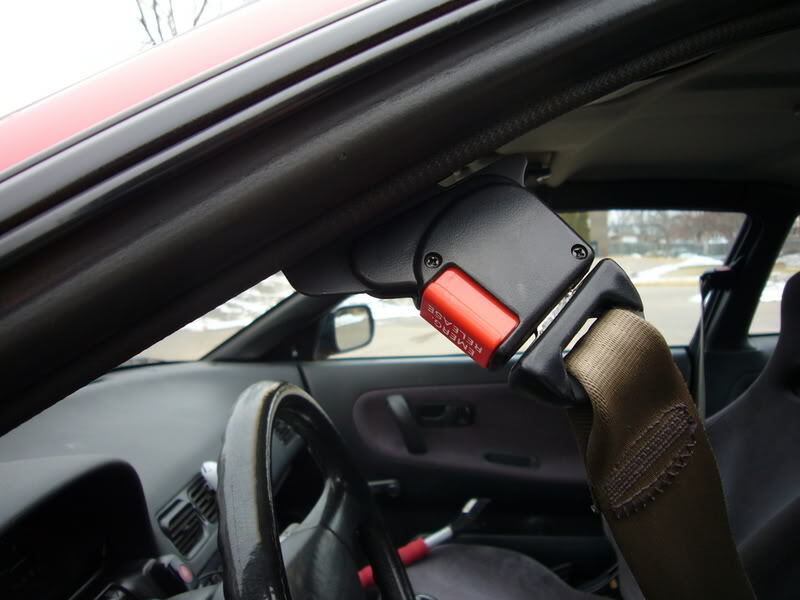 Start out by making sure you have not tampered with any part of the seatbelt system. Any modification to the system will most likely void the warranty. My 1989 240SX S13 had a non functioning shoulder belt. It stayed in the driving position all the time, to get out of the car I had to unbuckle it. This was tiring, as 2 belts is more annoying than one. The seat belt light would also flash any time the key was in the ignition, regardless of what was plugged in or unplugged, but the warning beep never sounded. Also, my lap belt was often annoyingly difficult to buckle. After spotting a thread here on Nico, I realized that all these problems should be covered by the warranty. I took off to Kline Nissan in Maplewood, here in MN. I sat down and talked to a service writer named Mike. I made the rookie mistake though, I had not done my research. I asked Mike about the warranty and he told me it was only in effect for 10 years, another service writer agreed with him. I thanked him and left quietly. With the information held in this article, you should not have the same problems as myself. I planned to go back, though I wanted some weapons for round 2. I started digging. I found the actual wording from Nissan’s warranty database. Concerning seat belts, it said this. 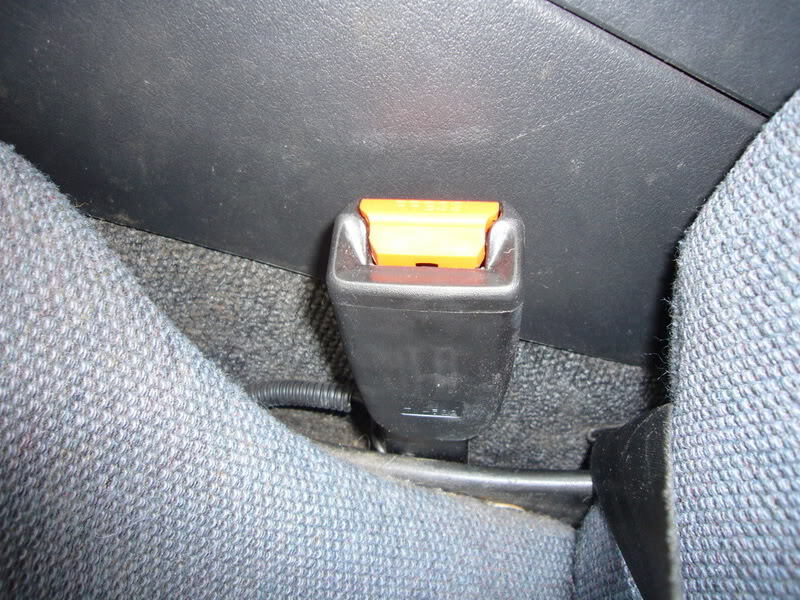 Nissan warranty information wrote: SB = Seat Belts – Useful life of the vehicle (for 1989–2002 vehicles), 10 years for 2003– up vehicles. This is what pulls up when a Nissan service writer looks up the warranty in their computer system. With that, I went in search of a little backup, just in case. I knew that if they refused again, my only chance was to place a call to the big bad boss, Nissan North America. When warranties are concerned dealers have discretion, but in the event of a disagreement, Nissan HQ has the final say. Nissan HQ is far less worried with spending a few dollars on a warranty, then it is with keeping customers happy. The number for Nissan North America’s consumer affairs division is 1-800-NISSAN1 (1-800-647-7261). I would suggest bringing this number with you. In case of any you has any problems with them, threatening to call that number should have swift results. The second time I walked into the service department, I didn’t waste any time. I sat down in front of Mike and told him what I had found. He listened quietly, typed a bit on his computer. Im sure he was looking at the Nissan warranty info, the same info I had. Now that Mike and I were on the same page, I decided to leave it to be inspected. I was told that there could be a $140 fee if it was not covered. I sucked it up, signed the work order. I had been afraid they might pull this, but I knew if I didn’t take the chance, I would never know for sure. 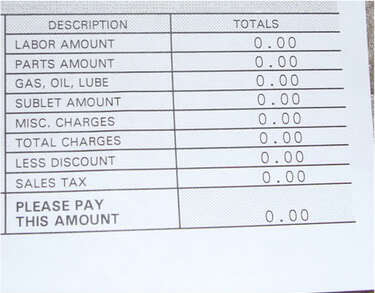 This is a normal inspection fee, and you will only be charged this amount in the event that Nothing is covered. If you tampered with anything, this is where it could come back to bite you. My gamble paid off, more so, then even I had hoped. My retracting motor was indeed bad, and would be covered by the warranty, but it gets better. 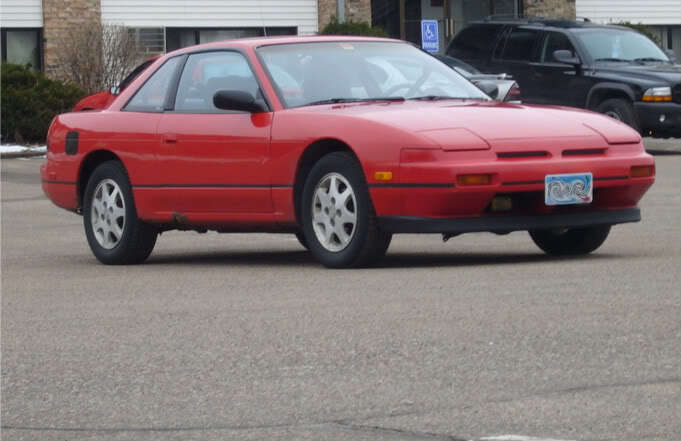 In 1995 a recall was initiated for many of the S13 models. Part of the plastic release button on the lap buckle can break. Shards of plastic can then fall into the buckle. These plastic shards can keep the belt from buckling, or they can cause it to unbuckle prematurely. The recall campaign had never been performed on my car. Along with the motor, they would also be replacing the buckles. 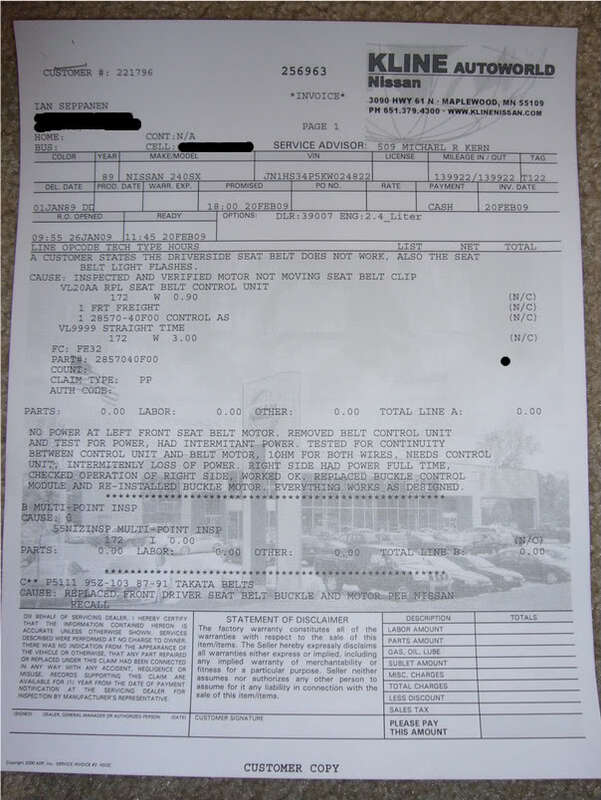 Because everything was covered, either under the warranty, or the recall, the inspection was free of charge. Remember, they should only charge you for the inspection if nothing is covered. They put in the order for all the parts, and I picked up my car. They promised to call when everything came in. Depending on the age of the car, I would allow at least 2-3 weeks for parts delivery. 2 weeks later the call came, the parts were in, and I could drop the car off when ever I pleased. I would suggest leaving the car with them for the day, as a lot of interior needs to be removed, and you dont want to sit around all afternoon. I arranged for a ride home. When I arrived, I asked if the car would be finished that evening. The service writer looked at the schedule, and said he was not sure. I told him to call me by 5 with an update, that way I could arrange a car for work the next day. 5 pm rolled around, and the call came. There was a problem. They had installed all the parts, the seat belt light no longer flashed, but the shoulder belt still would not retract. They informed me that a new seat belt control module was needed. They had ordered the parts for overnight delivery, but the car would not be ready for at least two days. This was a situation I had not planned on. 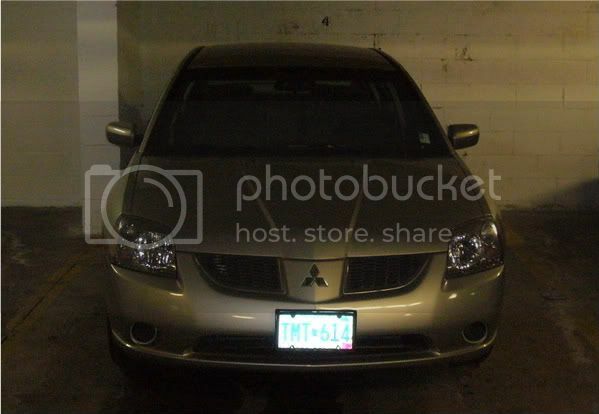 I had my wife drop me off at Nissan, and 15 minutes later I was driving away in a 2006 Mitsubishi Galant. I was incredibly impressed at this point. They were treating me like the owner of a brand new Nissan/Infiniti even though Im driving a 20 year old S chassis. Just another reason I love Nissan. Two days later Mike called, they said the car was done. As I pull in to the parking lot I spotted her. Parked out front is my S13, though she looked nothing like I left her. When I dropped it off, it was very salty, I had neglected washing her for weeks. Now she sat sparkling clean, washed only hours before, not a water spot on her. As I stepped through the door, Mike smiled at me. A work order with my key was laying on his desk. He turned it around, handed me a pen, and pointed at the bottom of the page. I signed the completed work order, thanked him generously, and switched the rental key for my own. 5 min later I was on my way home, car exactly how I left it, except clean, and with a working seat belt. This is definitive proof, I had my seat belts warrantied, for absolutely no out of pocket costs. And you can too. With the information in this article, any of you should have no problem following in my footsteps. How pretty my S13 looks after the wash. I almost forgot it could look this good. I kind of feel bad using it as a winter beater. The bottom corner, normally shows what you have to pay. I even shot a video of the shoulder belt moving, its so fast. I hope you guys find this useful. I really think this is something more people should know about. Nissan Consumer affairs phone No. 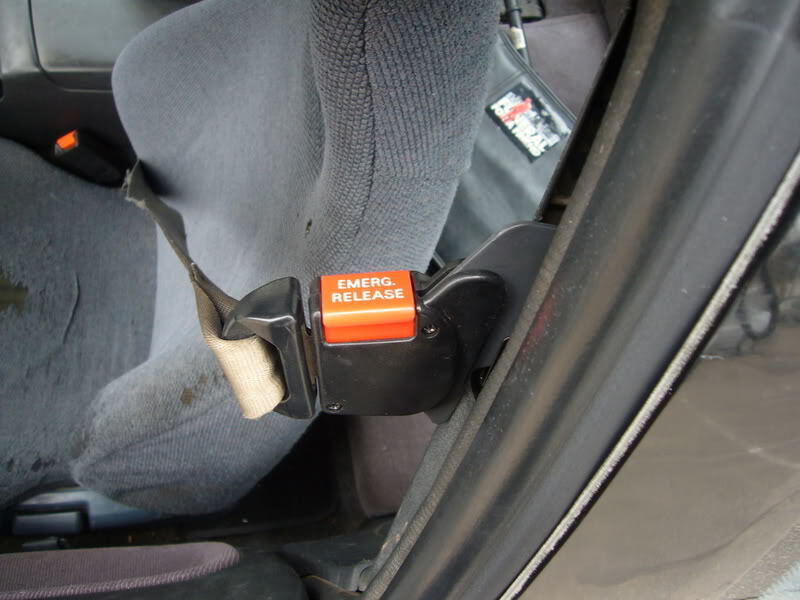 SB = Seat Belts – Useful life of the vehicle (for 1989–2002 vehicles), 10 years for 2003– up vehicles.